The cow smell had gone this morning. Good way to start the day. We had lots that we wanted to do today, so we tried to start as early as we could. We were out and driving by 9AM, which doesn’t sound early (and really isn’t), but it felt like we’d tried really hard. We wanted to visit the castle at Himeji, then rocket down to Shikoku to see the whirlpools in Naruto. 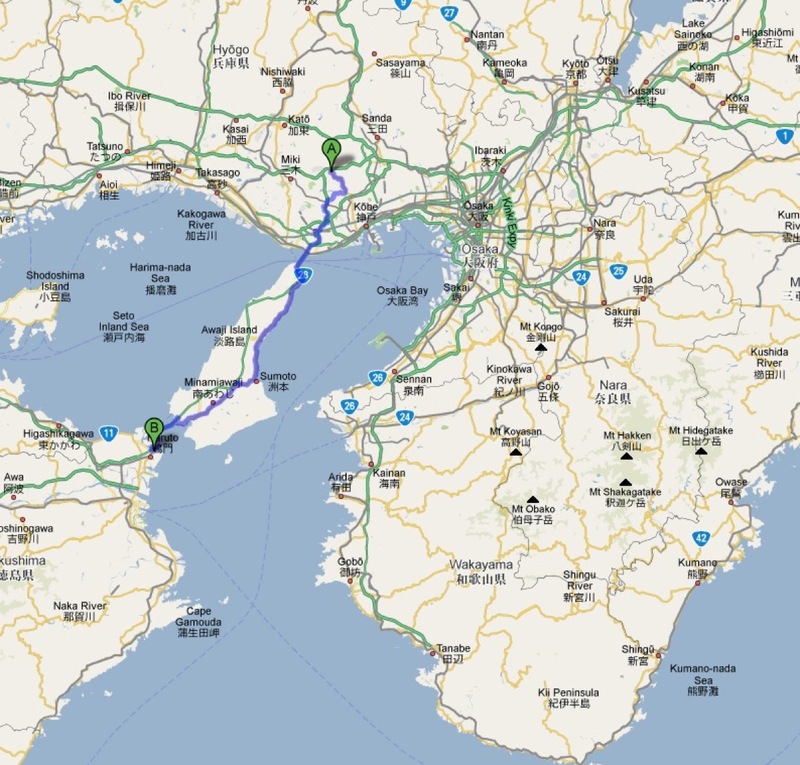 Looking at the map, it looked possible, but we didn’t know how much traffic there was going to be (or how lost we would get trying to follow the roads), so we played it safe, and saved Himeji Castle for another day (and hopefully that day will have better weather…). It was another stressful morning of driving, trying to follow roads that weren’t clearly signed (if you give a road a number, use it! Gosh). After several wrong turns, and me turning HMAS Delica around, we made it to the expressway between Honshu and Awaji Island. The bridge connecting is (was?) the world’s longest suspension bridge, and it certainly felt epic driving across the nearly 4km that it spaned. We had a quick rest and enjoyed the view back across to Kobe (and if you really squinted through the haze, Osaka). Awaji Island was the epicentre of the mid 90s earthquake that killed thousands (and caused significant damage in Kobe. 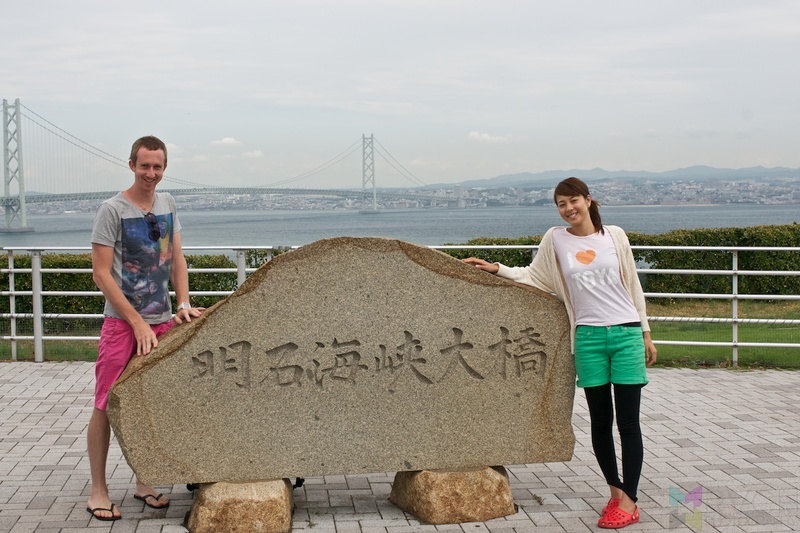 There were earthquake museums, but we kept travelling to the south, where we had to travel across yet another bridge across to Shikoku. Apart from a brief stop to fill up water bottles (12 of them) for ¥100 at a spring! Bargain! The semi-cloudy weather had turned into rain, which kept getting heavier. Awaji Island was a lot bigger than I had thought, and took longer than we had anticipated to get to the south (where we had to drive across another (smaller) bridge). 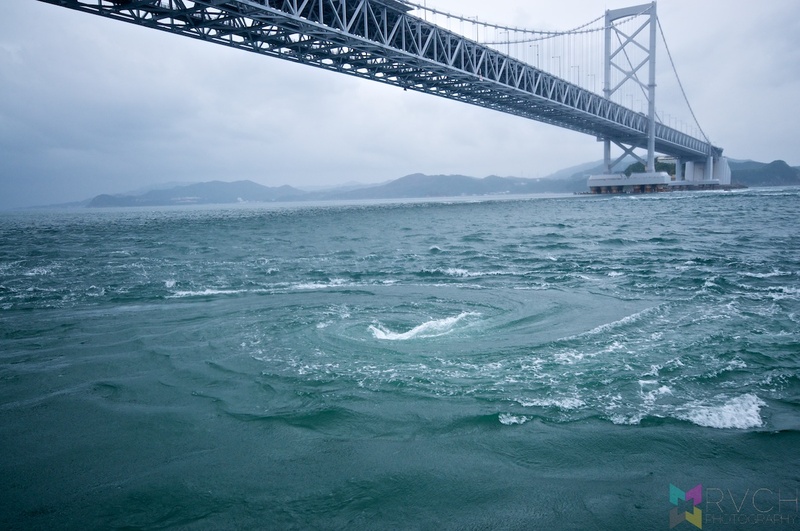 As we were driving across the bridge, we could see down to the violent currents from water entering/exiting the Inland Sea through a narrow straight that causes the whirlpools. This little glimpse had gotten us excited about the boat ride that we were going to do. It was ¥1500 for 30 minutes, and we were nearly alone on the boat (just another two Japanese women). It was barely a 5-minute boat ride from the port until we could start to see the turbulence. I didn’t think that the boat would get too close to the whirlpools (too many movies made me think that the boat would be pulled down and sunk), but the boat (which was the smallest of the tour boats) went straight into them. The whirlpools were smaller than we had thought they would be, but they were still quite impressive, constantly forming, shifting and dying. We were in amongst them for about 15 minutes, so we managed to see plenty of action. We hurried to get here because Risa had read that 2:30PM was going to be the peak activity time (we got there slightly too late for the 2:30 boat, and had to catch the 3PM one), but still had plenty of activity. While we were waiting for the boat to return for the 3PM departure, Risa started talking to a lady in the ticket office (who was in her 50s and a super keen skier, travelling to all the main Hokkaido resorts). The lady told us about a cheap local sento. ¥330, and it even had a waterslide (for children under 6…) as well as sauna and electric baths. Felt great being clean again, and especially since it was so cheap. The sento had a really nice feel about the place too, very old and original, nice tiles and character about it. A quick visit to a (oddly German themed) supermarket to shop for ingredients for a simple pasta, then back to a small car park that I had spotted (complete with toilet) on the beach to cook in the dark. Pasta sauce was delicious, as always, though the quick cooking pasta isn’t the best (though, it cuts cooking time, and therefore gas costs). We had the place to ourselves. It was nice and dark, and we couldn’t hear much over the heavy rain. Bliss.